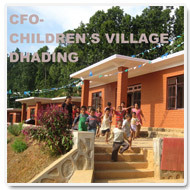 CFO-Nepal supports Nepalese children through its Sponsorshipand ScholarshipProgram which are carried out according to the guidelines of CRC, the Convention on the Rights of the Child, 1989. Most of these children are orphans who have lost their mother and father and children with one parent only. Some children have parents and come from very difficult economic background or a very remote area where access to an educational institution proves impossible. Many children are victims of the internal conflict through which they were orphaned or their families displaced.The children’s education and daily necessities are covered by individual CFO-Sponsorships which derive from individuals and organizations abroad.